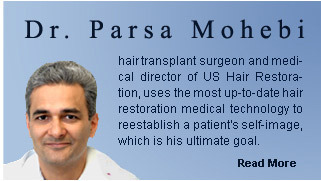 Dr. Parsa Mohebi is a hair transplant surgeon and the medical director for Parsa Mohebi Hair Restoration. Re-establishing a patients’ self image and self-esteem by using the most modern medical and surgical approach is one of Dr. Mohebi’s goals. He and his experienced staff are highly committed to using the highest techniques and devices. Dr. Mohebi is personally involved in all stages of patient care. Although Dr. Mohebi is an active hair transplant doctor in Los Angeles and South California, he also collaborates with many academic centers on studies on hair growth, gene therapy techniques and hair multiplications. Dr. Mohebi performed his internship at University of North Dakota followed by surgical residency at University of New Mexico and York Hospital. Dr. Mohebi then continued his aspirations in surgical research by joining the Department of Surgical Sciences at Johns Hopkins School of Medicine. It was there that he performed several studies on wound healing and hair growth using growth factors and gene therapy methods. Dr. Mohebi's main focus has been dedicated towards the research of hair growth, hair multiplication, wound healing and psychology of hair loss. Dr. Mohebi completed a fellowship in surgical hair restoration at New Hair Institute. Dr. Mohebi has many publications and presentations at national and international levels on hair loss, hair restoration and wound healing. He is involved in improving surgical methods and techniques on a daily basis. He is also the inventor of the Laxometer, a device that measures the mobility of the scalp before hair transplant procedure. Laxometer increases a surgeon’s accuracy and helps minimize the widening of scar tissue.